Summary:Kelley Armstrong, #1 New York Times bestselling author, takes an exciting new direction with this big, breathtaking blend of fantasy, romance, horror, and pulse-pounding action, perfect for fans of Graceling and Game of Thrones. With all the heart-stopping romance and action that have made her a #1New York Times bestselling author, and set in an unforgettably rich and dangerous world, this first epic book in the Age of Legends trilogy will appeal to Kelley Armstrong's legions of fans around the world and win her many new ones. 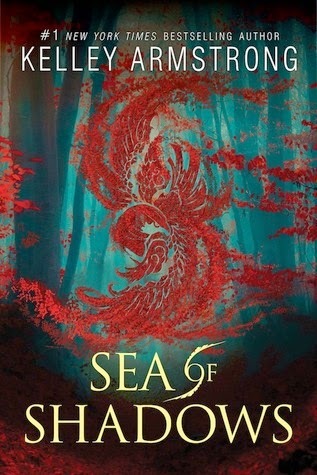 My Thoughts: I wanted to outright love Sea Of Shadows. So much, to give it 5 cupcakes. I am giving it 4 cupcakes. I didn’t love it as much as I wanted too. We are introduced to sisters Moria and Ashlyn. They were marked at birth to become the Keeper and the Seeker on their sixteenth birthday. I liked both girls! I think I may have liked Ashlyn a bit more though. She was the shyer one while Moria was outspoken and kind of loud in a way. I also loved their animals!!! At times I laughed at them and at times I wanted to cry for them. Their quiet little hometown is ruined. Everyone is murdered and only a few people survive. I also loved both love interests. Gavril and Ronan. They each looked out for the girls and wanted what was best for them. They were so different from one another but they both respected and liked their main girl. So much happened in this one. It was hard to keep up at times but I flew through this book while reading. Each night before bed, I’d start reading and not stop until I actually fell asleep. It did go pretty fast. Moria and Ashlyn both have their own dilemmas to face and I liked the back and forth on the characters. One minute, we were reading about Moria, the next about Ashlyn and I liked that. It kept me entertained. The reason I didn’t give this one five cupcakes I guess is because even though I flew through it, and I liked it there were a few times I wanted to skip ahead. Some things didn’t really interest me as much as I hoped. I did enjoy this one and I can’t wait to read the next in the series! Overall: I loved Ashlyn a little bit more than Moria. And I loved Ronan a little more than Gavril so you can probably guess which chapters I enjoyed more. I liked Armstrong's writing. I’m excited to see where the story goes next. Cover: Like it but if I saw in a bookstore, not sure I’d pick up or not. But since this was recommended to me, I’m glad I did.